Microsoft has given a detailed look at what Outlook 2016 will look like across Windows 10 on desktop and mobile devices. 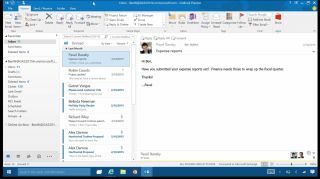 The apps, which will debut inside Windows 10 in July, give a brand new mail and calendar experience that promises to be richer and offer a higher level of integration across Office 365, according to the latest episode of Office Mechanics, Microsoft's inhouse video channel. Outlook 2016 desktop gets a range of improvements that include better cloud file support, deeper search and even a darker theme for those working on brighter monitors. Attaching files to email messages has been made incredibly simple thanks to the presence of recently used items in the attach file dialogue. This extends beyond local files and includes recently accessed files in a user's OneDrive account. Clutter is also now a part of the desktop client and its advanced machine learning capabilities helps sort through the emails that really matter to the user. Microsoft has also promised new support for groups and OAuth when the service comes out this summer. Windows 10 on smartphones and tablets gets a radical refresh that makes the service look very different to the Windows 8.1 version and chief among the new features is the addition of full Microsoft Word functionality. Editing emails now feels like writing a document in the popular productivity program with all formatting and insert settings present. Another snazzy new feature are swipe gestures that let users quickly move mail to trash, flag it up for later inspection, or you can even edit the gestures to your personal preference. Outlook on Windows 10 also has a direct link to the Calendar app in the bottom corner that includes pinch and zoom gestures to zero-in on certain weeks or days. Cortana plugs in to all of this to handle mail sending, scheduling of meetings and a lot more. Windows 10 looks all set to be released in July, if AMD is to be believed, and between now and then we will learn a lot more about what Outlook will bring to the table.